Pressure reducing valves (PRVs) and temperature regulators help you manage steam, air and liquid systems safely and efficiently. And they ensure uninterrupted productivity by maintaining constant pressure or temperature for process control. Steam, liquids and gases usually flow at high pressure to the points of use. At these points, a pressure reducing valve lowers the pressure for safety and efficiency, and to match the requirements of the application. There are three types of PRVs. Direct-Acting. The simplest of PRVs, the direct-acting type, operates with either a flat diaphragm or convoluted bellows. Since it is self-contained, it does not need an external sensing line downstream to operate. It is the smallest and most economical of the three types and is designed for low to moderate flows. Accuracy of direct-acting PRVs is typically +/- 10% of the downstream set point. Internally Piloted Piston-Operated. This type of PRV incorporates two valves-a pilot and main valve-in one unit. The pilot valve has a design similar to that of the direct-acting valve. The discharge from the pilot valve acts on top of a piston, which opens the main valve. This design makes use of inlet pressure in opening a large main valve than could otherwise be opened directly. As a result, there is greater capacity per line size and greater accuracy (+/- 5%) than with the direct-acting valve. As with direct-acting valves, the pressure is sensed internally, eliminating the need for an external sensing line. Externally Piloted. In this type, double diaphragms replace the piston operator of the internally piloted design. This increased diaphragm area can open a large main valve, allowing a greater capacity per line size than the internally piloted valve. In addition, the diaphragms are more sensitive to pressure changes, and that means accuracy of +/- 1%. This greater accuracy is due to the location, external to the valve, of the sensing line, where there is less turbulence. 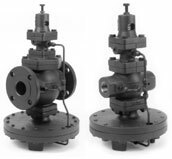 This valve also offers the flexibility to use different types of pilot valves (i.e., pressure, temperature, air- loaded, solenoid or combinations). Designed for steam, water and non-corrosive liquid service, self-actuated temperature regulators are compact, high-performance units. They operate simply and are therefore suitable for a wide variety of applications. Flexible mounting positions for the sensor, interchangeable capillaries and varied temperature ranges make installation, adjustment and maintenance quick and easy. For more information on pressure reducing valves, contact Mead O'Brien at (800) 892-2769 or visit http://www.meadobrien.com.